Paris and Rome are two of the most popular cities to visit in Europe. Paris, the city of love and light, is the most visited city in Europe due to its famous Eiffel Tower, Montmartre, and the Louvre. 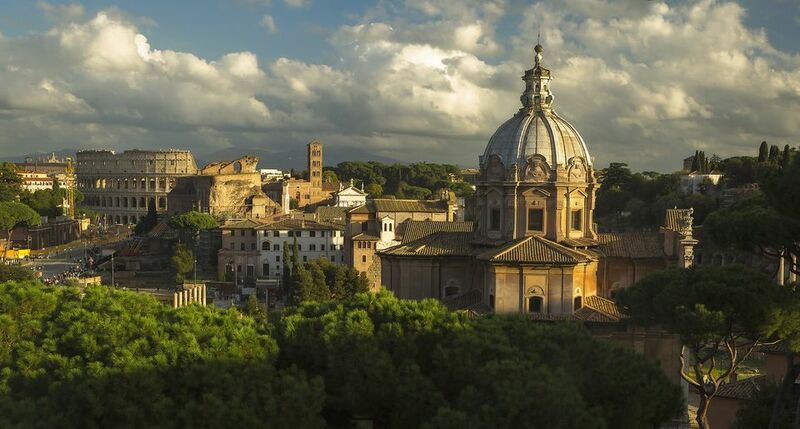 Rome is also a major player thanks to the Colosseum and its delicious Italian food. Although they're 880 miles apart, the two cities are easily paired together for a European vacation—especially in the peak tourist season of summer when there are more flights and train times. Or, you can make a road trip out of it and stop at some of the sights along the way (Lyon, Milan, and Florence). Of course, the quickest way from Paris to Rome is by plane, which takes only two hours if you fly direct. However, don't worry about blowing the budget on airfare; you might be surprised how cheap flights are in Europe. For the route between Paris and Rome, the most affordable carriers include Ryanair, easyJet, and Vueling, with Iberia coming in as a medium-cost option. Just make sure to read the fine print because some of these budget airlines fly out of smaller airports that are outside the city center and farther than the bigger hubs. There are four airports around Paris, some closer to the French capital than others, while there are two main airports in Rome. So for example, Ryanair may have direct flights as low as $45 round-trip, but you'll be traveling from the Beauvais–Tillé Airport (75 minutes north of Paris) to Ciampino–G. B. Pastine International Airport (a half hour southeast of Rome), and you'll have to factor in the cost of public transportation to/from the airports. EasyJet and Vueling, meanwhile, fly nonstop from Paris Orly Airport to Leonardo da Vinci–Fiumicino Airport, Rome's main international airport, for as low as $89 round-trip. Keep in mind that these are base fares, meaning you may be charged extra to reserve seats or check luggage (and carry on bags, in the case of Ryanair). The fastest route by rail is on Trenitalia or SNCF, France's national railway company. Both trains can take you from Paris to Rome in about 11 hours, with two transfers in Turin and Milan. Another option is Thello, the night train from Paris to Italy. It leaves Paris from Gare de Lyon, one of the city's six main stations, and takes roughly 15 hours, including a train transfer in Milan. If you have a France-Italy Rail Pass you will pay less. Many people like this option, although even with a rail pass it tends to be more expensive than a budget airline. All passengers on the sleeper trains from Paris to Italy must reserve a sleeping berth in either a sleeping-car or more economical couchette car (four or six bunk-style beds.) You cannot just book a seat on these trains, although the beds convert to a seat for the morning. The driving distance between Paris and Rome is 880 miles (1,420 kilometers) and takes about 14 hours. The fastest way to go is on the French Autoroute to the Italian Autostrada, which has a higher speed limit but you'll have to pay tolls. From Paris, travel south through Lyon and cross the French-Italian border heading to Turin; here the roads open up to stunning views of the Alps in northern Italy. Then, go east to Bologna and turn south toward Florence, where you'll cruise through Tuscan vineyards and countryside before ending in Rome three hours later. The perk of driving is you have the flexibility to make detours or stops to see some of the best sights, cities, and scenery across France and Italy. If you can, extend your stay to make the most of your road trip. The bus is the least convenient option as it takes roughly 22 hours, has multiple transfers, and tends to be somewhat expensive (between $100 and $300 round-trip). Eurolines is the main bus company that serves routes between Paris and Rome, but it is slow and relatively expensive. Compare other bus routes on sites like GoEuro and FlixBus.